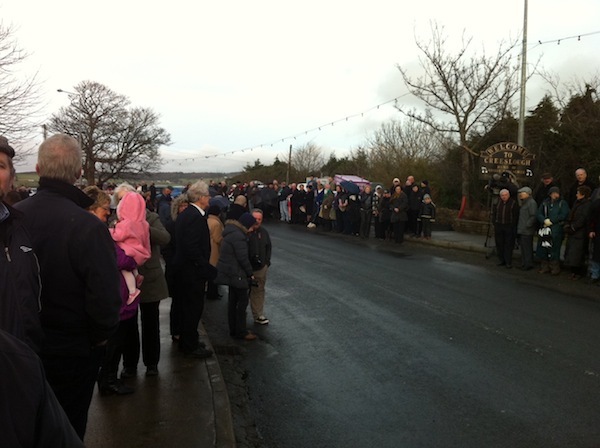 Almost 500 mourners gathered on a hillside cemetery today to say a fond farewell to renowned singer Bridie Gallagher. Ms Gallagher, who was called ‘Ireland’s first international popstar’, was buried at Doe Cemetery outside her beloved birthplace of Creeslough in Co Donegal. A lone tin whistle player sounded the tune of ‘The Town I Loved So Well’ as mourners braved driving wind and rain for the burial. A funeral Mass had taken place earlier at St.Bridget’s Church, Derryvolgie Avenue in Belfast where Ms Gallagher had moved to from her native Donegal in the 1950s. 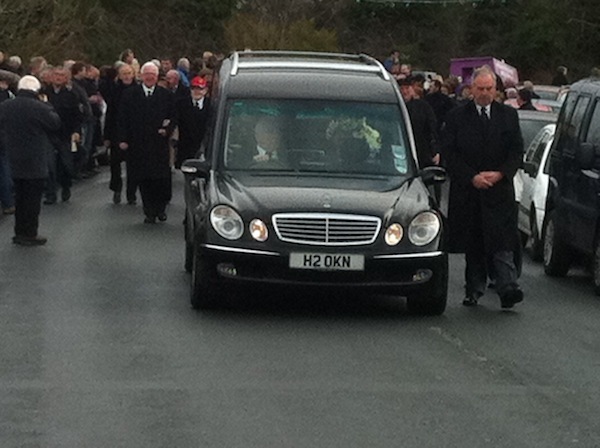 The chief mourners included Ms Gallagher’s son Jim Livingstone and her sister Maggie Curran. As the funeral cortege entered the town, Mr Livingstone and his family emerged from the funeral car and thanked people for turning out. “Thank you everyone for turning out. It means so much to us and to Bridie,” he said. 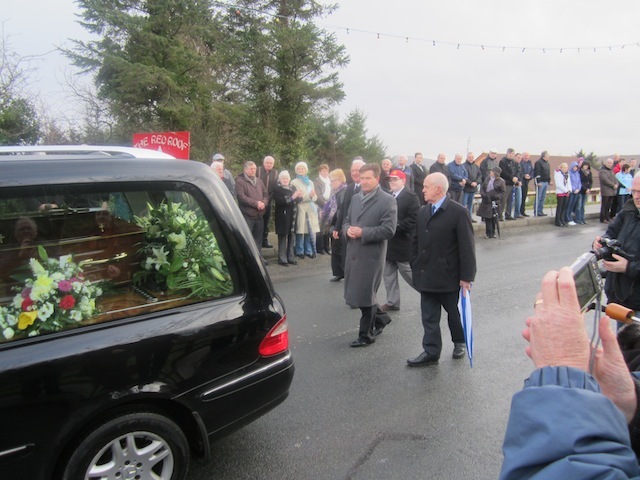 Also leading the many mourners was close family friend and singer Daniel O’Donnell. Mr O’Donnell, who flew in from Texas for the funeral, said Ms Gallagher was one of the first singers to inspire him. “She was a fantastic woman and I wanted to be here today for her return to Donegal. “She was one of the first singers who inspired me and I just wanted to say thank you and goodbye to her,” he said. The graveside prayers were said by local priest Fr Joseph Broidy. Ms Gallagher, who was 87, passed away at her home in the early hours of Monday morning last. Better known as ‘The Girl From Donegal’, she was a world remowned singer and had played the Sydney Opera House, New York’s Carnegie Hall and London’s Royal Albert Hall. She had inspired a generation of singers including Daniel O’Donnell and Paul Brady. Her life was tinged with sadness after another son Peter, 21, was killed in a motorbike accident in 1976.